A big star cast, an International cruise, and even bigger production house and a story that has been told many a times hitherto with almost forgettable songs but yes good screenplay and dialogues is what comprises of Zoya Akhtar's ambitious project- Dil Dhakadne Do. Is it all about the film? Well there is more. There are actors and some superlative performances. There is "real life ex lovers-paired against each other again" on screen and same old [read ghissi pitti] story of "rich dad forcing poor son in to a marriage of convenience and commerce. But is that all? Well no, read more to know more. Zoya's DDD or D3 is set against the backdrop of a beautiful sea cruise in International waters with drool worthy locales including Greece and Istanbul, and the roads were Zoya's Characters - Farah and Kabir, goes racing, takes you heart away and you too want to take your bike and ride away. Holla there's more, lets see one by one. The Story: D3 is a story of a Punjabi upper class family that is shown to be dysfunctional, though to me, it sounded perfectly normal like usual families unlike the ones from Karan Johar's Films [3KG families] This is the story of " how Ayesha and Kabir" from Ayka finds their voice against their scheming parents and pukes it too. 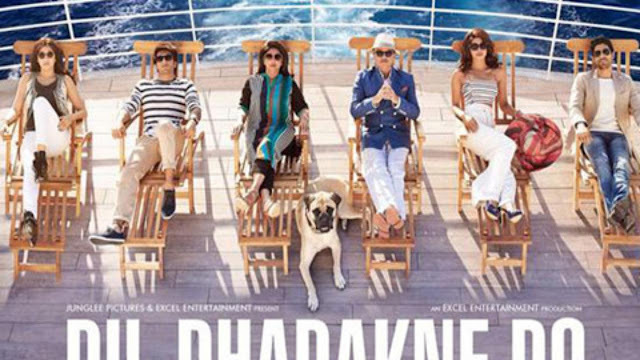 Dil Dhadakane Do is the story Kamal Mehra [Anil Kapoor], his wife Neelu [Shefali Chayya] and their children Ayesha and Kabir played by Priyanka Chopra and Ranveer singh respectively. Story begins when Mehra's plan to celebrate their Wedding Anniversary Via a 10 days cruise with Friends, family and Probable "49% investor via a family collaboration" business tycoon, who coincidentally has loads of money than anyone, yet were not finding a suitor for their lovely daughter who was ditched by her fiancee for a hippy gal. Yippee, oops yikes. And off course there is a lovely pooch [voice over by Aamir Khan] who looks most cute after scheming yet sober Mrs Mehra and her son, who in spite of their conniving behavior, successfully takes a lot of sympathy. What you said -how about the adorable Farhan Akhtar? Well, he reduces to a mere stereotyped cameo [still better than the "why of all people him" Rahul Bose who was a perfect cast for his role and perfect spoiler of a probable eye candy in the D3 store] decipher yourself. So as stereotype as it gets, Mehra's business is in doldrums and by hook or crook, he needs to book his prodigal son [against a bribe of plane] with the cute looking daughter- Noorie [So well played by Ridhima] to get the business going]. If you wonder how about bringing their daughter, who started and running a business, successfully on her own, aboard and seeing if things could be worked otherwise. But no, they are busy propagating "log kya kahenge" to their only daughter who wants to divorce her eccentric husband and her loud mouth "forever unwell with diseases you name it"Mother -in-law played by a graceful-onscreen Zareena Wahab. Why I said Wahab and not Panscholi, is no-brainer. The lady is much better and capable than that surname that reminds me of song from Subhash Ghai's movie "Pan-Choli ke peeche kya hai". No drifts please, we are on sea. A totally Contrast to their parents, Kabir and Priyanka are free spirited individuals, who when not being victim of their parents' bad relationship, are battling through their own relationships [ with their spouses off course] So the movie is all about messed-up relationships and how you should love your family. Even if that meant risking everyone's life and security and laws, just cause you saw "Life of Pie" and were so heavily influenced by it that you did not have lion, you took your pooch on life boat to rescue your son in vast sea to reunite him with his girl friend who is more popular for her "duck" acts than acting. Zindagi na Milegi Dobara. Sarcasm Alert! The movie quite unleashes the need of having our own version of Desi Titanic, with the legendary song- My heart will go on, loosely inspiring the movie title- Dil Dhadakne Do [Let the Heart Beat]. It has Aamir Khan, even though as voice-over of Dog [SRK you took note? ], so film is ought to be original. Aww I don't want to give away the story as I feel that movie is definitely a good watch for at least once or twice [suit yourself], primarily cause of some lead and some not so lead eye-candy [yeah] of performances. Well I won't call them greedy or selfish but highly entertaining. Contrary to public opinion, I thoroughly liked Ranveer Singh in this movie. He did full justice to his character and looked absolute fab [unlike his off screen jimmy choo and mooch avatars]. He did what he was expected to do, looked good and appeared what he appears to be. Priyanka Chopra too looked good in quite a many frames and had an author backed role wherein she play a woman who is uber cool, stylist and successful businesswoman but a timid and intimidated daughter, and wife. Adarsh bhartiya Naari- kaha milti hai aajkal [ideal Indian woman, where do you find these days?]. There is nothing much to write about Anushka Sharma here. She did what she does best- look good [unless you don't see her sea creature lips], throws attitude, wear skimpy cloths and all the works. There is no depth in her character, not it was required. lesser the screen time, better. Nevertheless, her character could be named as catalyst in movie as Farah Ali plays the one who drive Kabir towards following his own dreams in straight forward manner when she herself tricks her crew to meet the guest out of rule and still gets fired. There are other actors like Parmeet Sethi, Manoj Pahwa and Ridhima who did a good job cheering up the cliches in the movie. Rahul Bose looks like the stale idli trying to be a suave and up market Pizza, fails to impress or win eye-time ;) May be he was a perfect cast for the role he played and good for him that need not have to act but play natural self. Supporting ladies Zareena Wahab and Divya Seth did their roles well. The climax is little dampener and is little flawed but hey when do we see logic in Indian MOvies and neither did szunny boy who didn't stepped down on the boat to rescue the herculean family that rode life boat on Mediterranean sea. Overall, the movie is well paced and worth a dekko.